Subhas Chandra Pattanayak White tigress Sheha has given birth to four cubs in Nandankanan zoo on July 28. But the zoo director Sudarsan Panda has repeated the wrong in speculating how many of them are of ‘Royal Bengal Tiger’ (RBT) group. Sheer nonsense. The cubs are born in Orissa’s Nandankanan zoo to Orissa’s tiger Manish and tigress Sneha. How to the zoo director any of them is a RBT? It seems, the zoo director is reluctant to claim Orissa’s tiger as Orissa’s tiger. He is unable to come out of his cocoon of copying the non-Oriya terms when Oriya terms are available. Orissa is the home of the category of tigers known in Oriya language as Mahabala Bagha. There are three popular types of Bagha in Orissa. They are: Mahabala, Kalarapataria and Baghendra. In my childhood days, in my birthplace Tigiria and adjoining princely states like Baramba, Narasinghpur, Hindol, Dhenkanal and Athgarh, there was a tiger of small size called Baghendra, which perhaps is now extinct. Kalarapataria is a sort of leopard with synonyms like Kendua and Tindua. The Mahabala is the largest kind of tiger that has profuse mention in ancient literature and scriptures of Orissa. As Buddha is by birth an Oriya, our ancestors had projected him even as Mahabala. Mahabala is referred as a Buddhist deity. The word ‘Maha’ – the greatest – is a peculiar word of assertion of Oriya mana. As for example, Orissa’s great river is named ‘Mahanadi’ (Maha+Nadi). The food coming to devotees after being offered to Sri Jagannatha Buddha is ‘Mahaprasada’ (Maha+Prasada). The sea at Puri, the seat of Jagannatha, is ‘Mahodadhi’ (Maha+Udadhi). Similarly the great tiger of Orissa, bearer of Maha Shakti (Immense strength) is Mahabala in Oriya language. Therefore, the greatest son of Orissa for all time to come, Buddha, who is being worshiped as Jagannatha, is also known and presented and worshipped as ‘Mahabala Buddha’, his illuminating body evolving from the body of the Mahabala bagha. It is sad that, Oriya officers like the zoo director, are not projecting the great tiger of Orissa by its original name – Mahabala Bagha. They fear, lest the international community fails to understand the word. They are wrong. Even in England, what the Orissa zoo director wrongfully holds as RBT, is known as Mahabala. 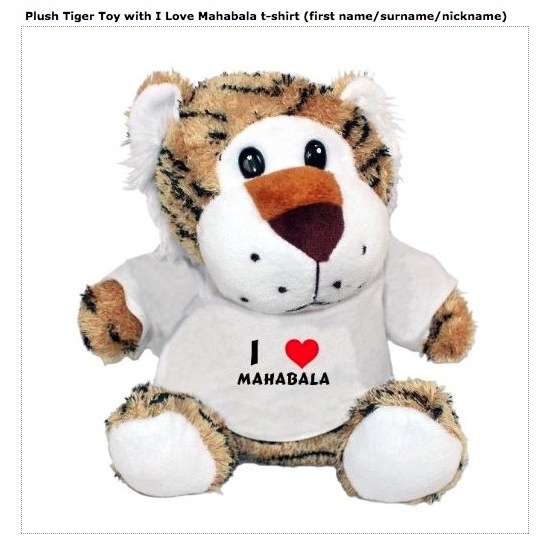 Mark the tiger toy with ‘I Love Mahabala’ T-shirt. It is so popular in U.K. and U.S.A. Children and adults there understand that Mahabala is a tiger. I fail to understand, why the zoo director is averse to call Orissa’s tiger as Mahabala bagha? And, a shame, he projects the Mahabala cubs of Orissa in the name of RBT! RBT is a confused English term which was created after the low paid servants of East India Company had occupied a weak Bengal, and had used the word ‘royal’ to self-assign them a blue blood tag. To keep this mischief alive till date may be no affront to Bengal, but is certainly an affront to Orissa, the ancient soil of patriotic pride that was the last land to be annexed by the British in India and the first land to rise in revolt for emancipation, as admitted even by the British historian G.Toynbee in the following words: “It was not long, however, before we had to encounter a storm which burst with so sudden fury as to threaten our expulsion…” (A sketch of the history of Orissa). So, on this soil of patriotic pride, Oriya officers like the zoo director, ought to practice how to project the great tiger of Orissa as Mahabala bagha. Let it be called RBT in any state; in Orissa it needs be called in its Oriya name – Mahabala Bagha – a name that carries Oriya mana and the great Oriya Buddhist and literary heritage. Very INTERESTING article followed by ‘ MAHA FUNNY ‘ conclusions ::: Director of the NKZoo to please react, a MUST, -n- awaited, therefore. Hope after going through your comments on the Royal Bengal Tiger the Director or Warden of Nandan Kanan Zoo, or any other official or individual would not commit further mistake of describing ‘Mahabala Bagha’ as Royal Bengal Tiger. Your paper analysis in this respect with the support of our own history and citing the pictorial example of ‘T-Shirt’ of British and American children is really an eye opener.